SCVHistory.com AP1711 | Placerita Canyon | Newhall 4th of July Celebration at Saxonia Park, 1909-1913. 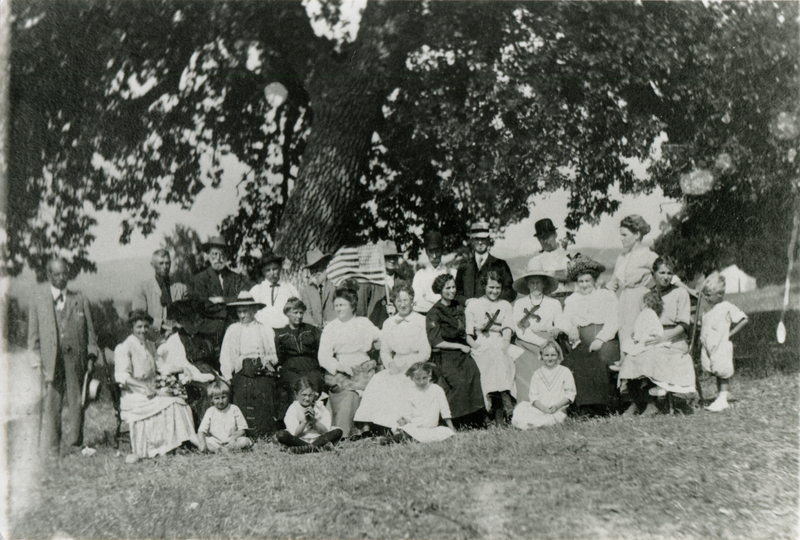 We can't be 100 percent certain because we have no written information to accompany this photograph, but we're filing it under "Newhall Fourth of July Celebration, Saxonia Park, 1909-1913." As for the date, that's a 46-star flag. The 46-star flag was adopted July 4, 1908, following the admission of Oklahoma in 1907. Based on our knowledge of the changeover from the 48-star flag to the 50-star flag, it took awhile for new flags to reach Newhall. So July 4, 1908, would be too early for Newhall to have had a newly adopted 46-star flag. The 48-star flag replaced it July 4, 1912, reflecting the addition of New Mexico and Arizona earlier that year. Likewise, Newhall wouldn't have had a new 48-star flag on July 4, 1912, so this could be as late as 1913, and perhaps even a year or two after that. At the time, Newhall celebrated the Fourth of July with a picnic and festivities at Saxonia Park. The park was located at the west end of Placerita Canyon at what is now 24912 Quigley Canyon Road (corner Cleardale). We don't know what it was originally called, but in 1924 the property was purchased by the Los Angeles Sachsen Verein Inc. (Saxony Society), whose members of the group were of German descent. They named it "Sachsen Platz" in honor of the homeland of some members. Assessor records show that in 1932, two large structures were built on the property. Around that same time, Newhall moved its Fourth of July celebrations to what was then called Newhall Park, adjacent to the (fourth) Newhall School, which had opened in the fall of 1925 on Walnut Street. Saxonia Park continued to be a popular location for get-togethers into the 1960s, although it was used less and less after the more centrally located Newhall Park (the "new" Newhall Park) opened at Newhall Avenue and the future Dalbey Drive in 1950. Los Angeles Sachsen Verein sold the Saxonia Park property in 1973. As of 2015 it is owned by Havenhouse Foursquare Church. AP1711: 19200 dpi jpeg from copy print.